Big Brother 4 Round 1 Each housemate was asked to nominate just one other, and all nominated housemates are up for eviction. Nominations were made only a couple of hours after the housemates entered the house, so not much can be gleaned from them, except perhaps that Anouska and Jon appear to have made poor first impressions. Big Brother 4 Round 2 Bit of a tangled mess, although the one thing that does stand out is the boy/girl split, with only Jon invading the girls' side of the circle by virtue of four votes from the boys. 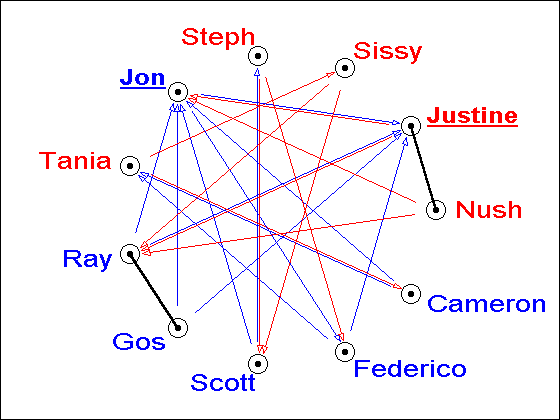 Ray and Gos both voted for Jon and Justine; Ray's vote for Justine saves him from joining them. Each mutual nomination is between a boy and a girl. Only Justine correctly identifies two enemies. Federico spares Jon, but Jon doesn't return the favour. Only Gos and Nush escape the voting completely. 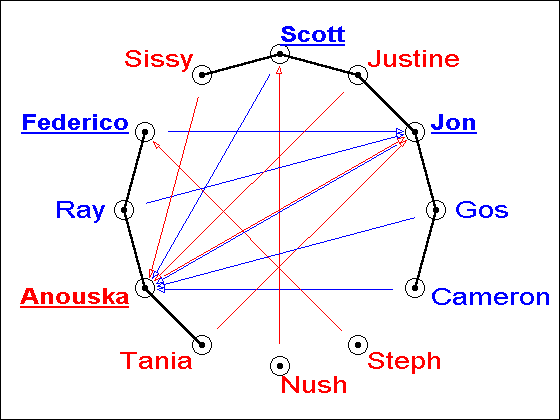 Big Brother 4 Round 3 The boy/girl split apparently continues, although Cameron finds himself isolated from the boys, in part because he nominates, and is nominated by, two boys, and in part because his own choices were the same as Nush's. Sissy is the only girl to receive votes from fellow girls. Her plea that no more girls should leave may be seen as an attempt to protect herself which has backfired. 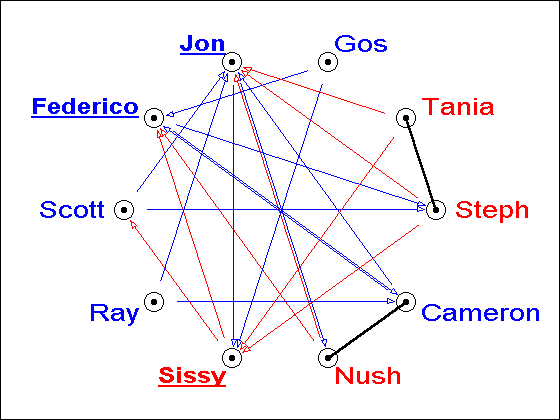 Gos, Tania, Steph, Cameron and Nush all vote for two of the final three who are up for eviction, and appear together in the circle. 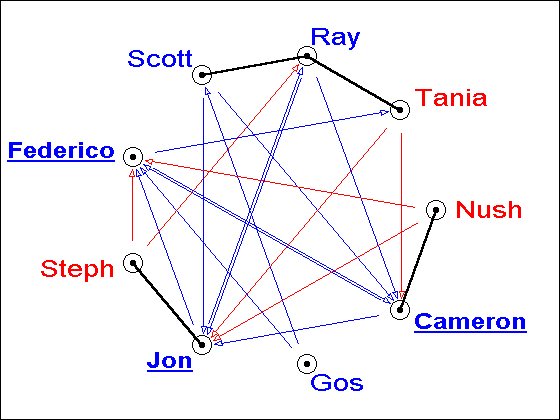 Looking at this potential 5-5 split in terms of gender, it appears that Cameron and Gos have become honorary girls, while Sissy has been singled out as not girly enough. Big Brother 4 Round 4 This week, at least three people are up for eviction and two evicted. Each of Scott, Ray, Tania, Nush and Cameron votes for two of the eventual nominees. Cameron in particular is up against the two he appears to want to compete with, although it's hard to see much tactical voting here. Only one vote goes to a girl: Federico's for Tania. The house appears to have had enough of losing girls. Jon's help in getting Cameron, Nush, Tania and, for the first time, Ray into the reward room this week seems in each case to have been repaid with a nomination.